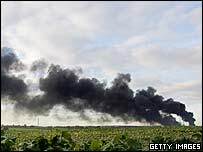 Environmental experts are monitoring pollution across southern England as a plume of smoke from the Hertfordshire fuel depot blasts drifts south. A research plane, normally used to investigate climate change, has been adapted to track the cloud. Elevated levels of soot have been recorded at air quality monitoring stations across southern England. But public health official Jane Halpin said samples taken on Monday had proved to be "very reassuring". Dr Halpin, the director of public health at the Hertfordshire and Bedfordshire Strategic Health Authority, said tests for asbestos in the smoke were "clear and negative". She said: "The sampling information we've had around air quality from earlier on today from areas around the Buncefield site has not given any cause for concern in terms of air quality." Checks with doctors and hospitals had revealed no significant increase in people reporting breathing problems, she added. However, she warned on Tuesday afternoon that residents around Hemel Hempstead should stay inside with windows and doors shut as a precaution. The warning came before firefighters put out fires in the last three of 20 oil tanks which had been burning since Sunday. Around 200 schools in a 10-mile radius around Buncefield have been shut since the blast, but most reopened on Wednesday. Earlier the Health Protection Agency admitted higher levels of soot and dust had been found at certain sites, but said the particulates seemed to be diluting and dispersing widely. But Ian Colbeck, professor of aerosol science at the University of Essex, said there was a possibility that the cloud could become toxic. "When petroleum is burned in a car it is burned under controlled conditions to minimise emissions. "Here it is burning freely so you're getting a vast amount of particulate matter produced and also you may get various chemicals being absorbed on to the particulate matter - some sort of benzene, and that is carcinogenic." Prof Colbeck was also concerned about what could happen if it rained. He said: "If it rained quite heavily then it would wash out - you would get an oily film over your car or your pond. "If it was more of a drizzle, it wouldn't necessarily clean the atmosphere to the same extent - you might be able to taste it in the air." The Met Office's Dr Jonathan Taylor said it was necessary to track the plume's progress with its research plane, jointly owned by the Natural Environment Research Council. "We decided that the position of the plume needed some closer attention - its boundaries and its altitude - in order to verify the forecast trajectory model that the Met Office is currently running," he said. Satellite images on Monday night showed the plume of smoke stretching for more that 70 miles across southern England and heading for France. It had reached Dorset and was spreading out over Hampshire, Berkshire, West Sussex, the Isle of Wight and towards the West country. People experiencing symptoms of smoke inhalation can contact NHS Direct on 0845 4647.